The students of Delhi Technological University can join the Alumni Association as registered members. Joining a good network is important for the future. Join us as student member to make connections with both recent and long-time DCE-DTU Alumni. As registered student members, you can access the online, searchable database of DCE-DTU alumni worldwide. They may approach alumni to seek career-related advice to DCE-DTU students and fellow alumni. Students also hold variety of events at campus. Registered students may announce student/alumni networking events on this website by contacting governing council. Registered students can volunteer to contribute to Alumni Association Events. This gives them opportunity to learn about the many facets of event planning, management and execution. 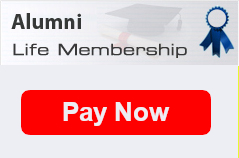 Join us as registered members of the Alumni Association. By joining the community, you will be tapping into a powerful network of personal and professional contacts. The registered members also get access to the closed group that has been created on Linked in to facilitate networking of the DCE-DTU Alumni from across the world. The best way to stay connected to the University is by becoming a member of the DCE-DTU Alumni Association after graduation. This way you are ensuring that DCE-DTU stays a part of your life for years to come.